On the border between Umbria and Le Marche is a beautiful estate in the Candigliano Valley, between the towns of Piobbico, Apecchio, Urbania and Sant'Angelo in Vado. The property is accessible via a well maintained dirt road of about 4 km. On the estate is a lovely main building where wine tastings are organized in the summer. There are 3 rustic, renovated houses with 11 apartments. The apartments are stylishly furnished and each apartment has a private terrace with garden furniture. 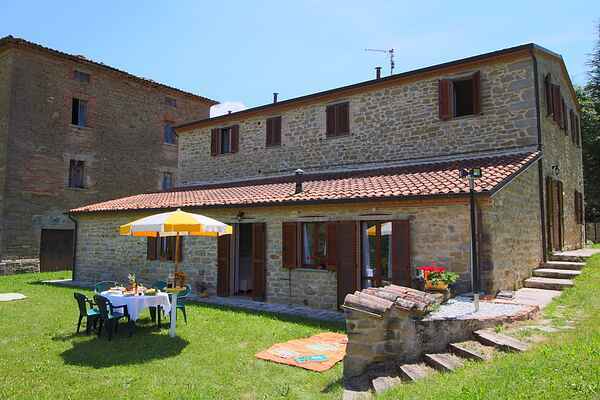 The rustic houses are located a few hundred meters from each other and therefore there is plenty of privacy. The garden is spacious. Apartment Rosa Gialla is situated in the rustic house next to the beautiful main building about 100 meters from the pool. The apartments are suitable for guests who wish to combine an active holiday with plenty of rest and relaxation such as the swimming pool with hydro massage. From the estate many trips are possible like visiting the cities of Urbino, Gubbio, Assisi and Perugia. Also, you can mountain bike or go on hikes in the hills and mountains in the area. Upon arrival you will receive a bottle of wine and a free wine tasting is organized weekly.